Crystal Nails Clear builder gels - exceptional reliability. Different density, strength, high-quality for extra use as well. To create long-lasting nails, every step has to be perfect starting with the base. 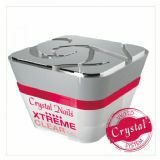 The most populat Crystal Nails clear builder gels are: Titanium and Xtreme Clear gel, Xtreme Clear is the strongest Crystal builder gel, so it can be pinched and shaped very well. Also perfect for to create extreme nail shapes with it. Titanium gel is a special medium thick builder gel, it can be used for both short and long nails. Gum gel a medium soft clear builder gel, it can be perfectly used at the salon work, as it can be spread easily. You can use it as a base layer at problematic clients, it is very flexible. Builder Clear I is a thicker builder gel, with an iceblue colour. That is why it has colour brigthening effect, which makes the French free edge more vivid.Can't be Pinched. Builder Clear II is a clear soft builder gel, which is recommended for creating short salon nails. Acid free.